This is the new toon for Allen Forkum's February issue of Automotive Report which features a humor column by Buster Mcnutt. Only way I'd ever lead one of those workshops would be if they let me carry a tranquilizer dart gun. 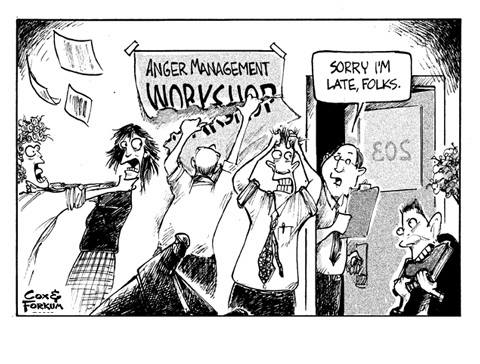 I have serious misgivings about the concept of managing one's anger. It sounds similar to leashing a pit bull: you can jerk it around, but it ain't going away. In fact, trying to "control" anger ( as opposed to eradicating it ) seems to fuel the resentment of being force-fed "happy thoughts". I've come to realize pin-pointing what makes you angry is a start. How to re-direct that s***? You got me. Ever notice how men can get into a vicious fight or argument and there's no hard feelings a day later. Meanwhile, women will fight and hold a grudge forever. As for the anger management stuff, there's one school of thought that you should restrain it, but what happens is it just accumulates into a nuclear blast. The other school is to let it all hang out in brutal honesty and let it go before it explodes. However that brutal honesty and opened feelings can prove to be just as damaging as anger. I think part of dealing with anger is to identify what triggers anger in you and working plans to avoid those triggers or escape them before damage occurs. I think one of the key things that causes anger is irrational personal expectations. We expect things to go perfectly or smoothly and when reality throws a wrench into those expectations such as a driver cutting you off we get mad. We also take a lot of the realities of life as a personal affront or insult which is also an irrational expectation. The last two weeks I've been working on a very frustrating project with unreasonable deadlines. Yesterday, when I was about ready to lose it, I decided to take Friday off as a sanity day - a day to regain some mental balance and composure. I'm glad to hear you invoked your sanity clause. Ever notice that some women will push an issue about 30 steps beyond the point where a man in the same situation would get his a__ kicked? Depends on whether it's "good" (positive, motivational) anger or "bad" (negative, detrimental) anger. With certain kinds of the detrimental stuff, I find that if I reorient my outlook, the anger takes care of itself. The problem is that it takes a lot of introspection & work to change oneself, & after I do the work, I find myself getting angry with people who refuse to endeavor to make the same changes that I've made--so I have something entirely new to get angry about. Picture yourself near a babbling mountain brook. Birds are singing in the crisp, cool mountain air. Nothing can bother you here. No one knows this secret place. You are in total seclusion from that place called the world. There now, don't your feel better? Hi, this blog is very usefull and i like this blog so much.i'll share this blog on my facebook page. Dreamin. I love blogging.Focus on your blog it is great. The amount that can you spend on a clock to dictate what kind of Clock and what features or functions that you may have. Clocks can in price from $ 2.00 and $ 3.00 all the way thousands of dollars and greater. This page contains a single entry from the blog posted on January 21, 2011 2:55 PM. The next post in this blog is Instructional Book Cover illustration.